Y'all are doing an awesome job reading a variety of books by Lucy Maud Montgomery. I'm delighted to see that Anne is ranking high on everyone's reading lists in 2010. I'm slowly working my way through your posts, but here are what a few of you have been up to. If you get a chance, I'd really encourage you to visit around and see what the others in the challenge are reading and thinking about. Amy at Hope is in the Word read Pat of Silver Bush and it's sequel, Mistress Pat. Catherine is reading it for the first time and picked up on a typo which kept her occupied for awhile! (I thought this post was quite awesome!) She also noted the wisdom of Anne and I couldn't agree more! Amber at the Book Basket read Anne of Avonlea, as did Alex. Annette read and enjoyed Anne's House of Dreams and I'm envious that she's on that title. That used to be my favorite (when I finally got to it). I remember being ELATED that Anne and Gilbert were finally married. I'm looking forward to reading it again. This book chronicles all of Montgomery's novels and puts them into the time line of Montgomery's life. 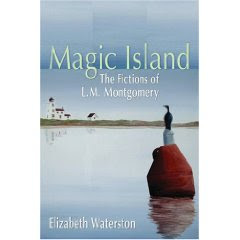 This book is meant to compliment Lucy Maud Montgomery: The Gift of Wings (click on title to read my review) and it gives the background information as to what was going on in LMM's life as she wrote each book. Some parts of me wants to know the "behind-the-scenes" of each book and other parts of me want to forget. So I'm moving through it slowly, but I am appreciating the information. The deadline for the Reading Challenge is Sunday, January 31st - so you have just about a week and a half left! Aside from my snippish remarks concerning the non-Montgomery spin-offs, I'm quite delighted with what I've been reading. I've loved reading your posts and I'm looking forward to see how far we all get this year! Thank you so much for participating and playing along! Oh these are so wonderful! I really did love Anne's House of Dreams!